Virtually everyone can be hypnotised although some people are more readily hypnotised than others. The most important thing is to be fully committed to the process and feel you can trust the hypnotherapist. Have you ever been “lost in thought” or day dreaming, driving for a distance and can’t remember which route you have taken? We go in and out of trance states spontaneously without realising it. Hypnosis is the state of inner absorption, concentration and focussed attention which can help you to use your mind more powerfully. Hypnosis was coined in the 1840’s and comes from the Greek word “hypnos” (or sleep). Although outwardly a person may look asleep this is not an accurate description of the experience. Which depth of trance is the most effective? There are a number of different levels of trance light, medium, deep and deeper still. The most beneficial trance state will depend on the individual and the therapist, working together in achieving the goals you want to achieve. You are in control. A hypnotised person cannot be made to do anything against their usual ethical or moral judgement or religious belief. Recent research in neuroscience is providing us with more insights into the brain and how hypnotherapy works. There is still much to be discovered. In the UK during the 50’s & 60’s research considering the uses of hypnosis alongside medicine was agreed to be advantageous and the British Society of Medical & Dental Hypnosis was formed. During the 70’s psychologists working alongside their colleagues from the medical and dental profession established the British Society of Experimental and Clinical Hypnosis. These advances in the UK saw the spread of the use of medical hypnosis world wide. Are there any conditions which can’t be treated with hypnotherapy? The benefits of uses of hypnotherapy are extremely wide ranging. Although there may be instances where it may not be advised to use e.g. severe mental health condition such as psychosis and schizophrenia or people with special needs. If in doubt contact us or seek the advice of your GP or health professional. AMendola Hypnotherapy provides a unique service using hypnotherapy and draws on a wide range of other techniques including Neuro Linguistic Programming (NLP). Helping people all over South Wales and beyond to conquer unwanted habits and self-limitations. 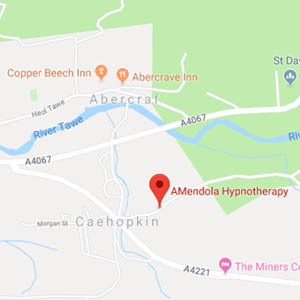 AMendola Hypnotherapy operates from a main base in the Upper Swansea Valley on the edge of the Brecon Beacons National Park. The base is within close proximity to: Ystradgynlais, Ystalyfera, Seven Sisters, Coelbren, Abercraf close to the Dan Yr Ogof Show Caves and Craig Y Nos Country Park. Located approximately half an hour’s drive away hour away from: Swansea city centre, Neath, Brecon, Merthyr Tydfil, Aberdare & The Rhondda Valleys. Services within the half hour catchment can easily be provided to people living in: Birchgrove, Pontardawe, Clydach, Morriston, Resolven, Aberdulais, Tonna, Glynneath, Ystradfellte, Hirwaun, Penywaun, Abercynon, Sennybridge and more. Get in touch to see if I cover your area! 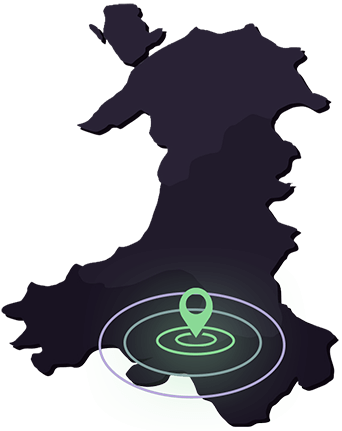 AMendola services are also provided for those living approximately within a one hour’s drive away in the South West Wales: Carmarthen, Pontarddulais, Llanelli, Ammanford, Burry Port, Llandovery, Llandeilo radius and also includes people living in: Gorseinon, Gowerton, Dunvant, Bishopston, Swansea Bay, Mumbles and the Gower, LLangennech. Services also provided to South East Wales: Cardiff City, Penarth, Barry, Cowbridge, Llantwit Major, Bridgend, Porthcawl, Port Talbot, Pontypridd, Porth, Treharris, Church Village, Bargoed, Caerffili, Tredegar, Ebbw Vale, Abergavenny. The service is also within easy reach to those living within the Brecon Beacons, Builth Wells & Llandrindod Wells.